Running for 27 years, Universal Orlando’s Halloween Horror Nights (abbreviated to HHN by its fans) is one of the most popular seasonal events in country. While Mickey’s Not So Scary Halloween Party at Walt Disney World focuses on family-friendly activities, Universal embraces its horror roots to create an edgy adult event. 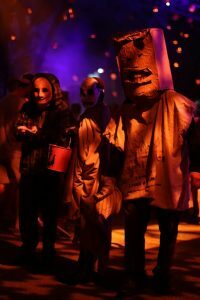 In this article we will cover frequently asked questions on tickets, touring tips, haunted houses, scare zones, shows, and information for those who wish to avoid the event but enjoy Universal. 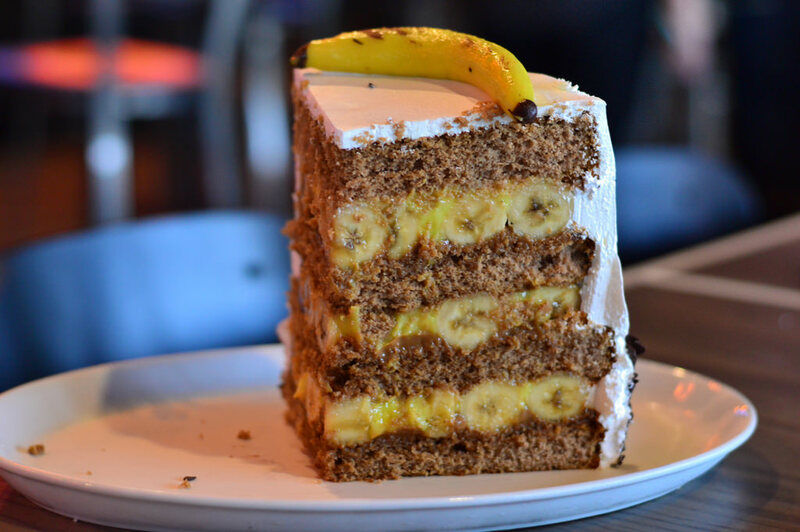 This article is written for a first-time guest or infrequent visitor who’s excited to attend. If you are interested in the experience of someone who was apprehensive, check out Dani’s “How to Enjoy Halloween Horror Nights When You Are Scared of Everything”. Universal and horror were deeply intertwined ever since Lon Chaney became Quasimodo in The Hunchback of Notre Dame. Cinemas were dominated for decades by classic Universal Horror films such as Phantom of the Opera, Dracula, Frankenstein, The Mummy, and The Invisible Man (along with some not-so classics like The Thing That Wouldn’t Die). Industry leaders in make-up, prosthetics, and costuming such as Lon Chaney, Boris Karloff, Bela Lugosi, and more more honed their skills while working on Universal’s horror movies. After a rocky opening in 1991, Universal Studios Florida entertainment created a fall event to bring in locals. 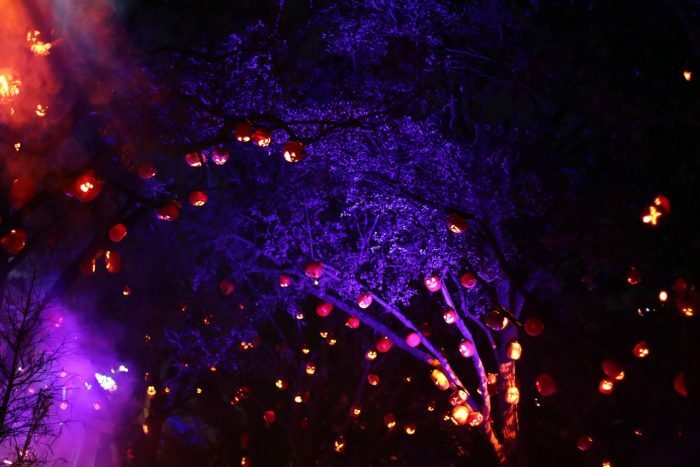 “Fright Nights” was born, a 3-day after-hours event with entertainment and one haunted house. The following year the event returns under a new name, Halloween Horror Nights, and 27 years later that event has expanded to ten haunted houses, five scare zones, and one show over 36 days. Day guests visiting Universal during Horror Nights frequently ask “How much Horror Nights will I see during the day?” During normal park operating hours (8:00 a.m. – 5:00 p.m. on event nights) day guests cannot experience the haunted houses, shows, scare zones; scary or gory props used during the event will be hidden and there will be no scare actors in the park. Horror Nights only starts after the park has been “swept” of day guests. Feel free to tour the park without the fear of being scared. But what about after Universal Studios Florida closes, what is there to do for those not attending? Islands of Adventure will remain open until 8 p.m. or 9 p.m. on event nights while CityWalk’s restaurants, clubs, and Hollywood Drive-In miniature golf remains open until 2 a.m. Additionally, Blue Man Group and the CityWalk Cinemark movie theater have nightly showings. Universal encourages resort hopping, so make sure to check out the other resorts on property. Note: Halloween Horror Nights is NOT for children. Reconsider bringing kids under the age of 13 and use your judgement for anyone under 18. Horror Nights is a PG-13 to R rated event. Universal Orlando’s Halloween Horror Nights 2018 runs on select nights September 14 through November 3. Excluding the first week and September 27 (due to a Microsoft Ignite conference park buy out), Horror Nights take place Wednesday through Sunday every week. Universal Studios Florida closes at 5 p.m. on event nights and reopens for Horror Nights at 6:30 p.m. Choose Your Night: Tickets start at $62.99 plus tax, and guests choose the night of their visit with prices based on date. Keep Your Date Flexible: Tickets are $81.99 plus tax, and guests are able to visit any one Sunday, Wednesday, Thursday, or Friday event night. Keep Your Date Flexible with Saturdays: Tickets are $89.99 plus tax, and guests are able to visit any one Sunday, Wednesday, Thursday, Friday, or Saturday event night. Rush of Fear Pass: Tickets are $95.99 plus tax, and guests are able to visit the first three weeks of the event (September 14 – 30). Frequent Fear Pass: Tickets are $106.99 plus tax, and guests are able to visit every Sunday, Wednesday, and Thursday night plus the first two days (Friday, September 14 and Saturday September 15) and the last Friday (November 2) of the event. Frequent Fear Plus Pass: Tickets are $122.99 plus tax, and guests are able to visit the same nights at the Frequent Fear Pass plus every Friday night of the event. Ultimate Frequent Fear Pass: Tickets are $203.99 plus tax, and guests can visit every night of the event. Horror Nights Express Pass allows guests to bypass stand-by lines and dramatically reduce their waits. Passes start at $79.99 plus tax per guest and grants access to the Express line for each attraction and haunted house once that night. In the past waits for houses like American Horror Story and The Walking Dead have soared above two or three hours on busy days; Express can reduce these waits up to half. If Express is not sold out Universal will sometimes sell a heavily discounted Express Pass active only after 10 p.m. Check locations that sell Express at 9 p.m. or later to see if there is availability. Note: Express Passes offered to guests staying at a deluxe Universal Orlando hotel are not valid during Horror Nights. Also, Express Pass is not a valid admission into the event by itself. Do you crave no waits at all? If money is no object, guided RIP Tours provide guests immediate access to all the houses and Academy of Villains show. RIP Tours pricing varies by night, ranging from $159.99 to $349 plus tax per guest. Private RIP Tours are also available; call 866-604-7556 for pricing and more information. As with Express Pass, admission to the event is not included. Universal Orlando offers special events, discounts, and merchandise for Annual Passholders during Horror Nights. Premier Passholders get one free Horror Nights ticket on select dates. Early Access Event for all Passholders grants early entry to select houses on September 14, 15, 21, 0r 22. Free button through October 1 to 31. Buttons can be picked up next to Men in Black or in Marvel Super Hero Island. Single-day tickets start at $56.99 plus tax and multiday passes are provided at a $10 discount. Meal plans offered at a 10% discount for Preferred, Power, and Seasonal Passholders and 15% discount for Premier Passholders. RIP Tours are offered at a 5% discount for Power Annual Passholders and 10% discount for Premier and Prefered Annual Passholders. Horror Nights houses are fully accessible by wheelchair; some scooters might not be permitted through the houses. Strobe lights and fog are heavily used in scare zones and houses, especially Dead Exposure and Stranger Things. Some houses use fake smells that could irritate some. Horror Nights is LOUD, if you are sensitive to sharp noises or loud volume bring ear plugs. If any of these warnings give you pause then reconsider going for your own health and safety. The big day is here and you are ready to get spooky. So… what to do? How do you effectively tour the park? How did some guests get in the park early? Are there any attractions open? Be inside Universal Studios Florida prior to close at 5:00 p.m. (to be safe, be inside an hour prior to closing). Go to a Stay and Scream holding location at Springfield (Duff Brewery), Hollywood (near the Hello Kitty store), or New York (across from Transformers). Find the event staff in orange shirts. They will scan your Horror Nights ticket and you will be admitted to the holding area. Universal security sweeps the park for guests and Horror Nights is set up. Springfield Stay and Scream: Houses located at KidZone and/or to the right of Men in Black. Hello Kitty: House located on Hollywood. New York: Houses near the front of the park and Race Through New York. By having a leg up over the guests entering at 6:30 p.m. guests can experience several of the most popular houses before the event starts, giving one a head start in touring. Stay and Scream is subject to cancellation or changes at any time; see Guest Relations to verify. Haunted Houses are the backbone of Horror Nights. Every year Universal builds new walkthrough E-Ticket experiences for guests based on original concepts and existing properties (refereed to as “originals” and “IP”). The houses are grand in scale, surpassing many walkthrough attractions and on par with anything found in the most elaborate queues designed by Disney and Universal. This year Universal has ten sinister houses for guests, the most ever, based on popular properties and terrifying original concepts. Travel to the Upside Down as you relive the search for Will in season one of the hit Netflix show. Visit detailed re-creations of Mirkwood, Hawkings National Laboratory, and the Byers house while trying to survive the relentless attacks of the Demogorgon. Stranger Things will be the most popular house this year. Visit immediately at opening or in the last half hour of the event. Walk into Freeling house during the investigation into their poltergeist phenomenon. Based on the hit 1982 movie guests will cross over and will come to the light with Tangina as their guide. Poltergeist will resonate with fans and the general public alike. Visit the house either immediately at opening or the last hour of the event. Michael is back and he is terrorizing the town of Haddonfield. Guests will see his escape from a prison transit and see the wake of his destruction as he hunts down his niece. Halloween is located in the Shrek attraction and is one of the first houses guests see when entering. This location is also usually the last to open for the evening. Visit after seeing Stranger Things or Poltergeist. If the house is not open yet, skip it and return in the last two hours of the event. The cult classic returns to Halloween Horror Nights with a maze based on the twisted collection of Halloween fables. Sam and his friends are the guardians of Halloween and they’ll teach you the correct way to respect the holiday and what happens to those who don’t. Trick r Treat will receive long lines at opening from Stay and Scream but will quickly reduce an hour after opening. Happy Death Day and The First Purge come to life in this follow up to last year’s surprise hit house. Happy Death Day is a murderous Groundhog Day as a college student tries to solve the mystery of her death, and The First Purge is the latest entry into the anarchic franchise. Blumhouse is located next to Men in Black; visit the house any time during the event. Pay attention to the start and end times of Academy of Villains. Those who could not get a seat or are being let out will swamp this house. Carnies have built torture devices out of the decaying remains of carnivals and those who trespass will pay with their lives. An original concept, this house is highly anticipated by fans and Team Members. Located next to Stranger Things, expect this house to built up waits within the first hour of the event. Visit this house within the first hour of the event or visit the last two hours of the event. An epidemic has broken out in Paris and the mandatory antidote causes temporary bouts of blindness. Survive the hoards and chaos in the streets with only flashes of vision. Based on a fan favorite house, this house could be the most terrifying house this year. Dead Exposure waits will rise two hours after the event starts and level out through the evening. As guests make their way back to the front of the park or leave the waits will go back down. Due to the nature of the house the number of guests who walk through the house in an hour could be low; see this house within the first hour of the event or the last hour of the event. The Wicked Witch of the West has infected the land of fairy tales and guests will walk through the wreckage. There are no happy endings in this realm. Scary Tales is in a location with traditionally low waits with higher profile houses around it. Visit this house within the first hour of the event or the last two hours. Humans have been annihilated by an extinction-event-level meteor and invasive, killer plants are taking over. Explore an abandoned city while carnivorous plants are looking for their next meal. Seeds of Extinction will have an initial hit of guests from Stay and Scream and then lines will drop. Visit this house the first two and a half hours the event is open or the last two hours. Step into the B movies at the Slaughter Sinema where the schlockiest movies come to life. You’ll come face to face with murderous barbers, Amazon Cannibals from Planet Hell, the Beast Baby, and more in this original concept house. Slaughter Sinema will have an initial hit of guests from Stay and Scream and then lines will drop. Visit this house the first two and a half hours the event is open or the last two hours. Scare zones are interactive, large, free roaming haunts that focus on atmosphere and large special effects. Unlike houses there are no queue lines or waits to experience scare zones, making it a perfect experience as lines for the houses peak between 8:30 p.m. until 11:00 p.m.
Everyone’s favorite killer doll is back with a murderous toy fair run amok. Chucky’s minions have created torturous devices that turn you into the play things in the streets of Hollywood. Based on the cult classic from the 80s, Killer Klowns have invaded and are encasing humans in cocoons of cotton candy. Their giant circus tent will blast off and land every night at the New York waterfront. A barn holding all the haunted objects from the haunted houses at Horror Nights is set up in Production Central–and you are not alone. The rotting remains of Halloweens of the past are scattered around Central Park as pumpkin and flesh merge into one. Evil is awake and terrorizing the city of Cary, Ohio yet again. New Years Eve 1985 is crashed by an outbreak of vampires in this sequel to a hit scare zone from two years ago. The band is dead, vampires have taken over, and every time the ball drops in New York it is feeding time. 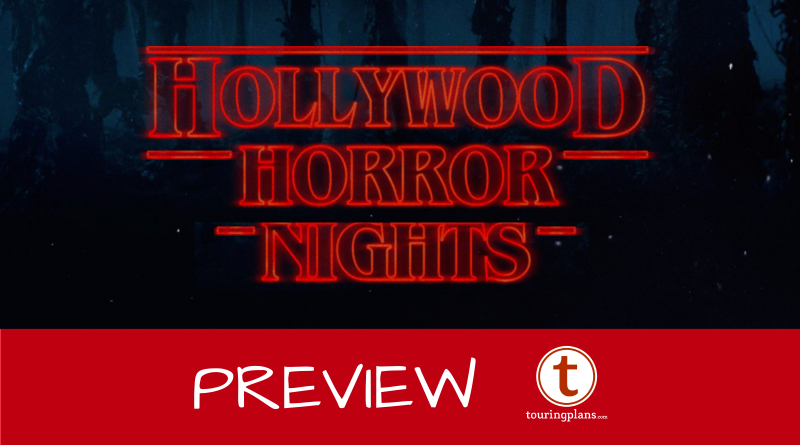 The fan favorite Academy of Villains returns to Horror Nights with a new show that celebrates the techno future as seen through 80s neon shades. The show combines dancers, acrobatics, and artists to create a mesmerizing 25 minutes of spectacle. The show was previously standing room only and is now in a theater with stadium seating, if you wish to have seats close to the stage arrive half an hour prior to show time (45 minutes on busy days). The least crowded show times will be the first and last shows of the night. 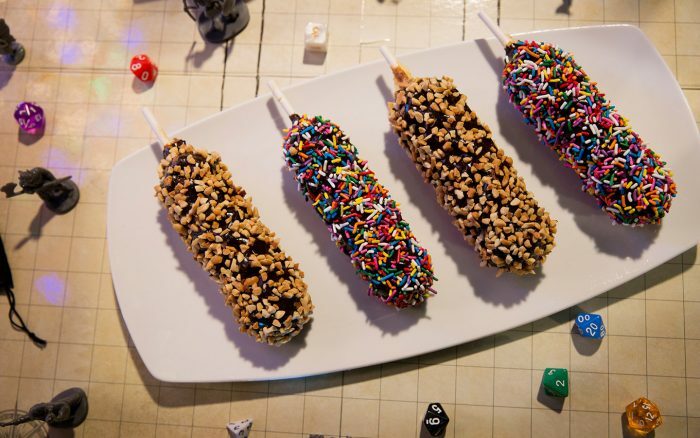 Horror Nights always offers unique, sinfully decedent food and drink, but this year they’ve turned it to 11. Universal Orlando is leaning into the Stranger Things tie-in by offering dessert-based waffles. Pick up Dessert Waffle Sundaes at the San Francisco Bakery, Waffle Ice Cream Pockets at Louie’s Gelato Window, and Waffles on a Stick (picture below) at a Benny’s Burgers (yes, based on the location in season one of Stranger Things). Pizza Fries are back at the KidZone Pizza Company and Mel’s is bringing back the Fiery Onion Ring Burger if you are craving something savory. Slurp up three new signature mixed drinks to wash it all down: Totally L.I.T. (vodka, tequila, gin, rum, triple sec, lime, sour, and Coca-Cola), Wicked Rad Punch (blueberry vodka, raspberry vodka, triple sec, lemonade, and grenadine), and the Gnarly Twist (a combo of the Total L.I.T. and Wicked Rad Punch). Universal also opens up several of its most popular attractions for Horror Nights. Wait times for the attractions are a fraction of the length during normal operating hours with many attractions having no waits. It is tempting to ride these attractions but it will cut into your time to experience the houses, scare zone, and Academy of Villains. Visit the attractions after experiencing Stranger Things, Poltergeist, Halloween 4, and the original houses by Men in Black but prior to the last two hours of the event. Touring plans for Horror Nights are hard to develop. Houses have strong word of mouth on quality (good and bad) and by the time a statistical sampling of wait times can be completed the event is almost over. Some general tips do apply year to year. Below is a rough guide and touring tips to follow. Be at the gates to Universal Studios 45 minutes before opening (an hour on busy nights), preferably participating in the Stay and Scream program. Upon opening make your way towards Stranger Things and experience immediately if the wait is under half an hour. Head towards Poltergeist, experience if wait is at or under half an hour. If over half an hour wait go to step 4 and come back at the end of the night. 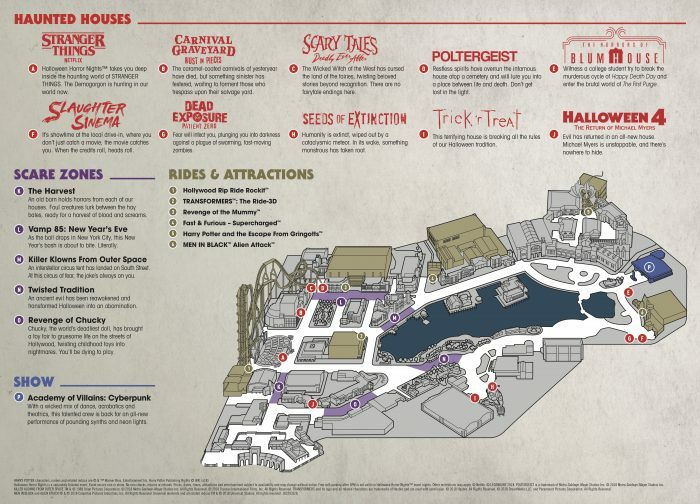 Proceed towards KidZone and the houses there (Trick r Treat and Seeds of Extinction). Experience Trick r Treat and Seeds of Extinction while the waits are under half an hour. If over half an hour proceed to step 6. Proceed towards Men in Black Alien Attack. Experience both Slaughter Sinema and Dead Exposure: Patient Zero. Check show times for Academy of Villains, choose a show time within the next two hours. If Academy of Villains has a show performing then experience Horrors of Blumhouse. Take this time to experience the scare zones, open attractions, Academy of Villains, eat, and drink. Remember that CityWalk is still open if things get too crowded in the park. Keep an eye out for any short wait times for houses you have not done yet. Within the last two hours of the event start experiencing the original houses at the front of the park (Carnival Graveyard and Scary Tales) and any of the houses at the back of the park. Within the last half an hour of the event experience Halloween 4. Return to any houses or rides you wish to re-experience or houses you had to skip earlier. 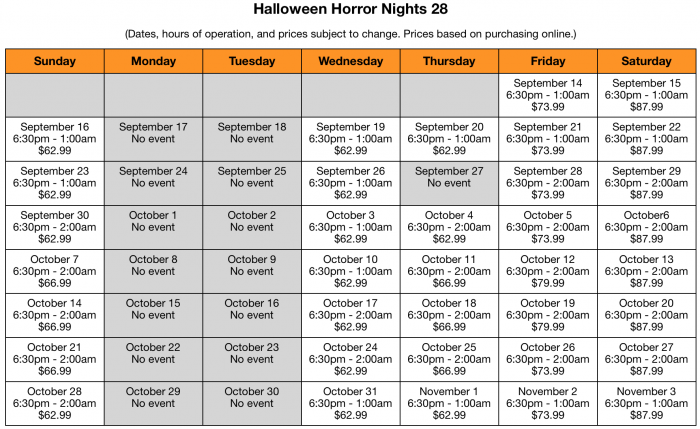 What are you looking forward to the most at Halloween Horror Nights 28? Leave your comments and questions below! Ask It: Universal Orlando Instead of Walt Disney World? I’ll be attending a week from today, and I’m getting psyched! If y’all get a chance over the weekend to review this year’s drinks and snacks, I’ll be much obliged. The one thing that bums me out in advance is that I really thought they might put together a special HHN version of the lagoon show, but that hasn’t materialized.